Turbocharged 2018 Jaguar F-Type i4 P300 Review – Is It Still Great? We’re living in interesting times right now, the icecaps are melting, the air is getting more polluted, worldwide temperatures are rising. But all hope is not lost, people are “trying” to make a change, governments are pressuring car manufacturers to produce more “environmentally friendly” cars. In response, we’re seeing more and more electric and hybrid cars, and a lot of auto manufacturers are placing smaller engines in their offerings and turbocharging them. The latest victim recipient of turbocharging technology is the Jaguar F-Type sports car, a car I have reviewed on many occasions previously. Jaguar is not the only manufacturer that’s going smaller displacement with turbocharging on their sports cars, manufacturers like Porsche and Ferrari are also doing the same thing, even Formula 1 went to smaller and turbocharged engines a few years ago. Last week I had the opportunity to drive the all-new 2018 Jaguar F-Type i4 P300 roadster, which is offered with the smallest engine. I’ve previously reviewed the supercharged V6 S and V8 R versions of the roadster, have a look at those posts for my thoughts on the overall car, in this post I’m mainly going to focus on the new turbocharged engine. 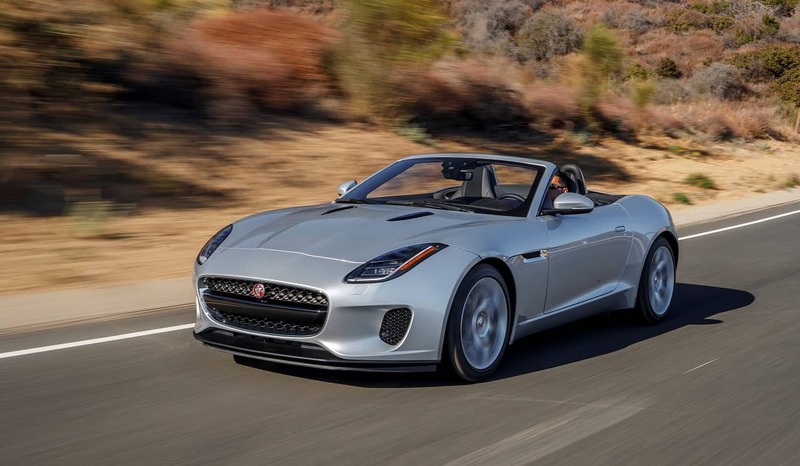 The 2018 F-Type i4 P300 is the lowest price F-Type roadster you can buy, it has a starting price of $72,500 in Canada. Our review car had a sticker price of $73,170, the only option on our review car was the $670 “Santorini Black” exterior paint. The only styling difference between the F-Type I reviewed last week the ones reviewed a few years ago is the new headlights and the rectangular (?) exhaust tip on the 4-cylinder model. Other than that, the interior and exterior remain the same, no new tech features have been added, as far as I can tell; so I’m not going to go over those, you’ll have to read my old posts. 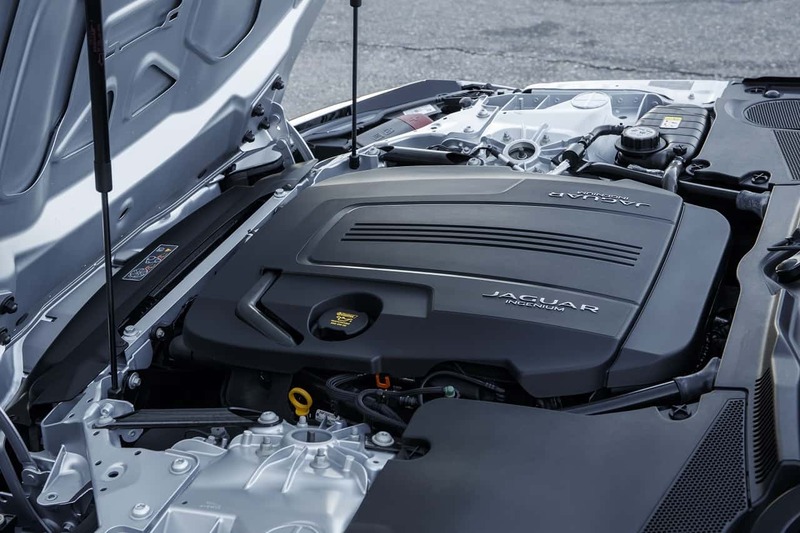 The biggest talking point on the F-Type i4 P300 is the engine, which is a 2.0 liter turbocharged inline-4 unit. This small engine produces 296 horsepower (300 metric HP, hence the name) at 5,500 rpm and 295 pound-feet of torque between 1,500 – 4,500 rpm. Power is sent to the rear wheels via an 8-speed ZF automatic transmission. The F-Type P300 can do the 0 – 100 km/h run in 5.7 seconds with a top speed of 250 km/h. The reason for the smaller engine is, of course lower emission and lower fuel consumption. Personally, I wouldn’t care about fuel consumption if I were buying a sports car, but here are the numbers anyway. According to the EPA, the Jaguar F-Type P300 should consume 10.2/7.8/9.2 L/100 km in city/highway/combined driving. For our review, in pure city driving, the onboard computer was showing 14.5 L/100 km in city driving, way off from what the claimed number is. However, the highway number was much closer to the claimed number at 9.0 L/100 km. In my experience, small turbocharged engines don’t do too well in city driving. 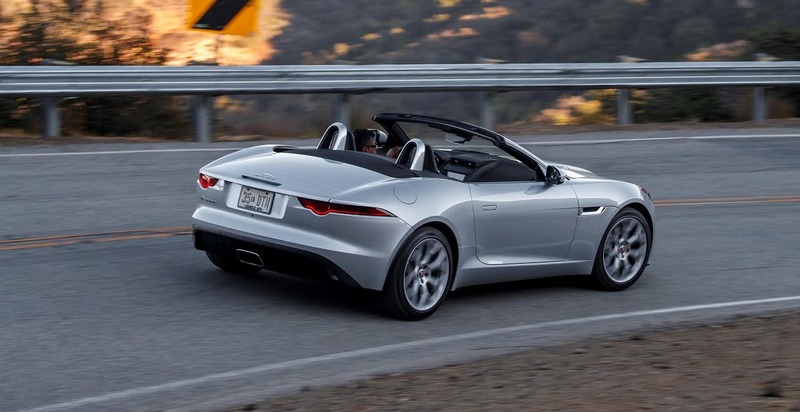 The big question is, how does the 4-cylinder F-Type drive? The answer is, it’s pretty awesome and the power is just about enough to have fun in city driving and on back country twisty roads. The engine revs up very quickly and the power is delivered pretty quick, there is a bit of turbo lag, which is to be expected. The F-Type P300 is a properly fast car and is a lot of fun to drive, it does lose some weight when compared to the V6. Even on the highway, it picks up speed very quickly and passing is accomplished with ease, the ZF transmission does a good job of quickly downshifting to pass. Although driving in normal mode, it isn’t as crisp at picking up speed for passing on the highway. Unlike the V6 S, if you want to have a lot of fun all the time, you’ll need to keep it in “Dynamic” mode with the transmission in “S”. Handling on the F-Type remains crisp, the suspension is very sporty but its neither too stiff nor too soft, it’s just perfect for twisty roads and soaks up bumps on bad roads. The steering feel is still great, and I did slightly feel the difference in weight, which has been taken off the front. Of course, I’d have to drive the V6 and 4-cylinder engine cars back to back to really feel a difference in the weight loss on the P300. Sound, that’s what the F-Type V6 S and V8 R are known for, among other things. The F-Type V6 S is probably the best sounding V6 I’ve ever driven, and I could spend all day just revving that sweet sounding engine. 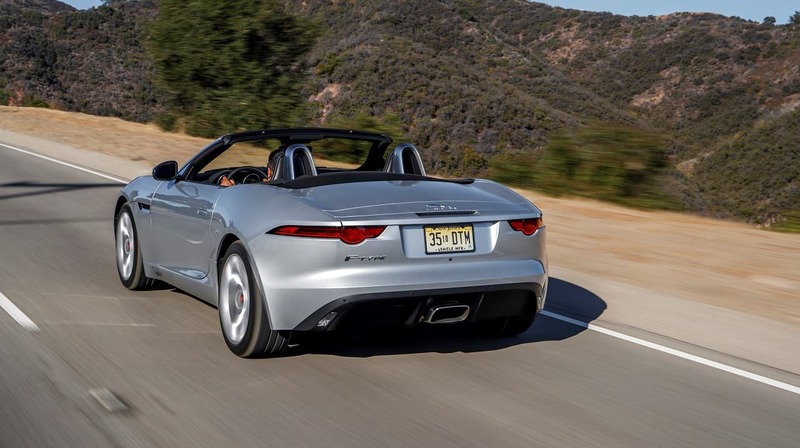 What’s the sound of the 4-cylinder F-Type? It’s not bad for a 4-cylinder engine, the signature popping and crackling of the exhaust on the other F-Types isn’t as prominent here, the P300 does do the popping and crackling, but it needs to be in Dynamic and Sport mode (transmission) and at high revs. I was expecting to hate the F-Type P300 4-cylinder, I didn’t hate it but I didn’t love it either. I personally think the F-Type P300 is a beautiful looking car, it handles really well, it has enough power, and it even makes the right sounds . . . but the problem is, the existence of the F-Type S and F-Type R, if those cars hadn’t come out before the P300 then I would definitely have fallen in love with it, but I know those cars exist and therefore I cannot love the F-Type P300. 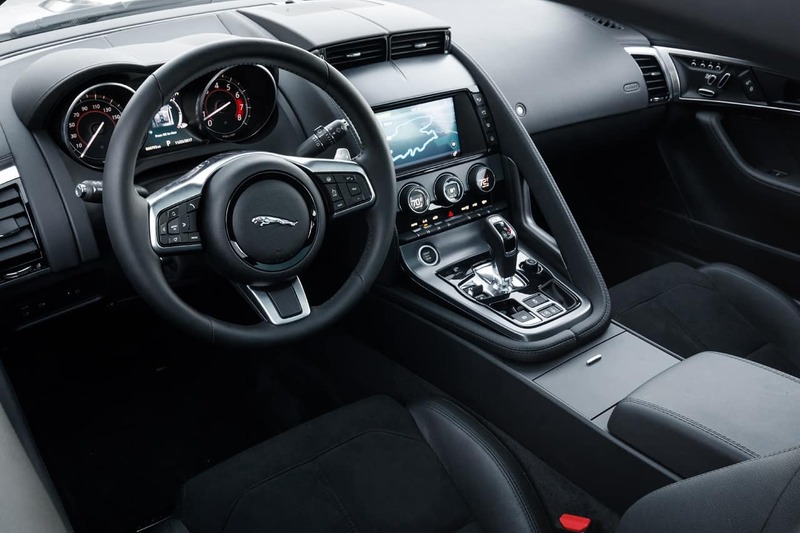 With the F-Type S and R, I would get goosebumps the second I pressed the start button and those goosebumps would last throughout the drive, unfortunately that was not the case with the turbocharged F-Type P300. For my money, I would spend the extra $20,000 to get the F-Type S over the P300. To answer the question in the title of the post, yes the F-Type i4 P300 is a great car, but it’s not for everyone.